Astronauts Sunita Williams and Akihiko Hoshide will venture back outside the International Space Station Wednesday for another attempt to install a replacement power switching unit that could not be plugged into the lab's electrical grid during a spacewalk last Thursday. 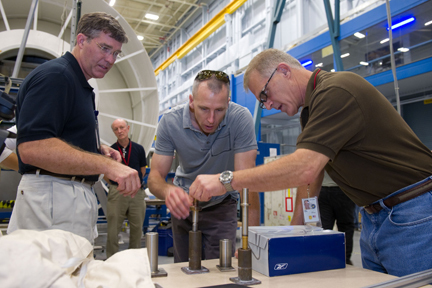 Equipped with an assortment of impromptu tools, the astronauts will attempt to clean the bolts needed to lock the 220-pound box in place, as well as the threaded bolt holes. During Thursday's spacewalk, metal shavings were seen inside the bolt receptacles when main bus switching unit No. 1 -- MBSU No. 1 -- was removed. While Williams and Hoshide attempted to blow out any remaining fragments using compressed nitrogen, they were unable to tighten down the replacement MBSU enough to engage cooling fins and gangs of electrical connectors. Without MBSU No. 1, the space station was only drawing power from six of its eight solar panels, forcing flight controllers to carefully manage the lab's electrical useage while spacewalk planners studied the bolt problem and what might be done to fix it. While that work was going on, the station's electrical system suffered another, unrelated problem, Saturday afternoon. A direct current switching unit, or DCSU, dropped off line because of a presumed short somewhere in the system, effectively cutting a third solar array out of the station's power grid. While the DCSU trip did not greatly worsen the station's power status, it marked the first time since 2007 that the lab complex has been forced to operate on just five of its eight power channels. The DCSU problem will be addressed later, possibly with another spacewalk to install a replacement. But in the near term, getting MBSU No. 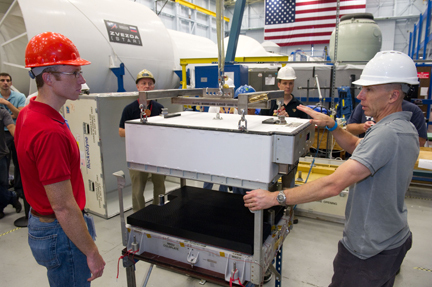 1 bolted down and tied back into the lab's power system is the crew's top priority. For identification Williams, call sign EV-1, will be wearing a spacesuit with red stripes while Hoshide, call sign EV-2, will wear an unmarked suit. The excursion is scheduled to begin around 7:15 a.m. EDT (GMT-4) Wednesday when the astronauts, floating in the U.S. Quest airlock module, switch their suits to battery power. 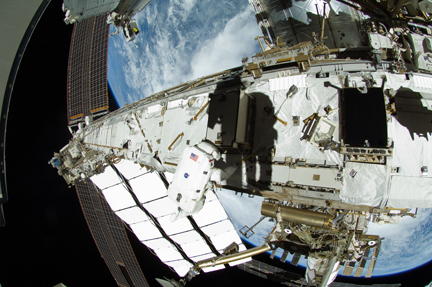 As with the spacewalk last week, Hoshide will spend most of the six-and-a-half-hour excursion anchored to the end of the station's robot arm. Williams will free float, focusing on cleaning the bolts and bolt holes. Preliminary plans indicate the astronauts will have about four hours to get the box installed. If not, the plan is to bring the MBSU inside the station for additional troubleshooting. The space station is equipped with eight 115-foot-long solar panels, four on each end of a football-field-size truss that runs at right angles to the lab's pressurized modules. The arrays rotate like giant paddle wheels as the station's orbits Earth to maximize power generation. Each pair of arrays extend from integrated electronics assemblies containing batteries, cooling equipment, charge-discharge units and a direct current switching unit that passes power downstream to the station and back into the IEA. The eight DCSUs deliver 160-volt "primary power" downstream to four main bus switching units mounted in the central S0 truss segment. Each MBSU takes in power from two arrays and routes it to downstream transformers known as DC-to-DC Converter Units, or DDCUs, which lower the voltage to a precisely controlled 124 volts DC. This so-called "secondary power" is then directed to the station's myriad electrical systems using numerous electro-mechanical switches known as remote power controllers. Main bus switching unit No. 1 takes in power from channels 1A and 1B, which is generated by one inboard starboard array and one outboard right-side array. The MBSUs are critical to station operation, providing grounding and allowing flight controllers or station astronauts to crosstie power channels or to isolate them as needed when problems develop. The MBSU removed last Thursday still delivered power, but it no longer responded to commands. Two bolts hold each MBSU in place, one longer than the other. During installation, tightening the longer bolt pulls the MBSU down onto a mounting fixture, automatically engaging interlocking cooling fins and electrical connectors. The second bolt finishes the attachment. During attempts to lock the replacement MBSU in place last Thursday, the main bolt refused to drive in far enough to engage the connectors and cooling fins. It's not yet clear whether the bolt ran into some sort of obstruction in its threaded housing or whether the threads themselves are the problem. "The most probable cause is likely a combination of a slight misalignment in the positioning of the spare unit for its installation prior to bolting and possible damage to the threads of the receptacle posts," NASA said in a statement Sunday. Williams and Hoshide spent the weekend servicing their spacesuits, recharging batteries and preparing tools intended to clean the bolt and the bolt holes to remove any metal shavings that might still be present. They also studied different alignment techniques to make sure the electrical box is level when they attempt to drive the main bolt with a power tool. "In preparation for the additional spacewalk, Williams and Hoshide have spent the weekend reviewing procedures and fabricating a series of tools to add to their handyman arsenal for the cleaning and lubricating of the MBSU's bolts and the S-zero truss post receptacles," NASA said in a statement. "If the MBSU cannot be bolted in place during Wednesday's spacewalk, an option exists for the spacewalkers to bring the unit inside the station for further analysis and troubleshooting." Depending on how that might play out, a third spacewalk likely would be required to finish the installation. But flight planners are hopeful it won't come to that.